So the Fed decision, statement, and commentary were largely as Macro Man expected, given the "shadow statement" presented here a couple of days ago. Sure, there were some differences- they used "gradual" instead of "cautious", and the bit about monitoring financial markets closely and being prepared to act was left for the press conference. Overall, however, it's fair to say that the Fed stuck the landing....for a few hours at least. Macro Man thought that Yellen gave one of her better performances at the press conference. "Tis true that she'll never be mistaken for Cicero or Churchill, but she generally managed to articulate her explanations in an intelligible way. She wasn't perfect- more on that below- but given the questions that she had to work with, she did the best she could. * "You can't hike again until inflation rises, right?" * "Why have you hiked"? * "Seriously, have you seen inflation?" * "Aren't you worried about a recession?" * "Holy crap, have you seen oil? How can you hike again when there's no inflation?" * "So about inflation. We don't have any, do we?" * "What would you do if there were a recession?" * "If everything goes wrong, do you have any tools you use to, y'know, ease policy again?" * "Boy, banks might have some interest rate risk, right?" * "What would you tell the average American about today's rate hike?" That last question was one of the better queries that Yellen received, and her answer- that it shows the Federal Reserve's confidence in the strength of the economy- is what we should have had two years ago rather than the serial moaning that emanated from the Eccles Building and beyond. 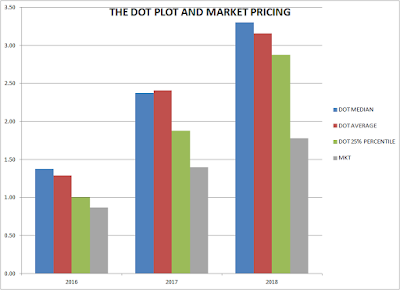 * "What if any message do you have for financial markets, given that pricing for future rate rises is much more conservative than the dot plot?" These questions were so obviously in need of a response that it beggars belief that no one asked them. The continued discrepancy between market pricing and the Fed's projections ("they're not forecasts") is remarkable, given that the FOMC has actually done the unthinkable and hiked. That market pricing for the end of 2017 is on par with the Fed median for 2016 is a pretty fundamental disconnect, and suggests that somebody- rates punters, equity punters, or the Fed- is in for an unpleasant surprise. On the inflation front, it will probably be the Fed. Macro Man had to laugh when Yellen said that she "wasn't aware of a better model" for forecasting inflation....because he wasn't aware of a worse one! 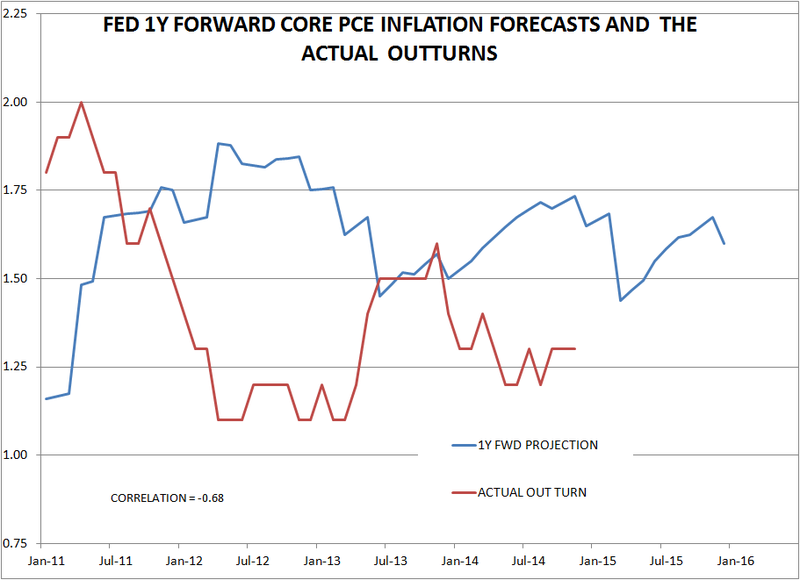 The Fed's inflation forecasting track record is, to put it bluntly, appalling. 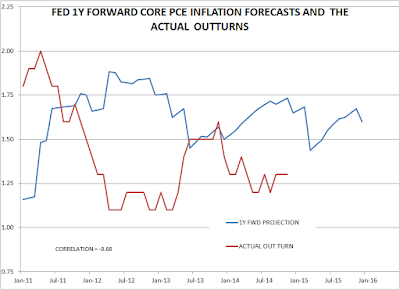 If you track the rolling 1 year forward projection for the core PCE deflator with the actual result, you find that they have a correlation of -0.68. Quite literally, they'd have a tough time being more wrong if they tried! Part of the reason, of course, is that the models can't see more than six inches beyond their own nose. So it's perhaps unsurprising that markets continue to expect less tightening than the Fed. That having been said, Yellen shook off every possible opportunity presented by the press corps numpties to state that the Fed's sole or even primary focus is inflation. By continuing to bring the conversation back to employment, she implied that solid economic growth could well result in more tightening, even without inflation manifesting itself in a broad sense. The Fed has stuck the landing for the time being...but the first routine is always the easiest. Whether they can continue to do so next year is up for debate. Not only is it reasonable to have doubts....it's probably unreasonable not to. Isn't it a good thing that the Fed, and hopefully other bank economists too, cannot forecast inflation (and growth, etc) well? Just imagine if they could predict the future well. We would have a whole lot more to worry about then! The Fed's policy announcement had one technical detail that didn't get much media attention but is actually quite important. The reverse repo (RRP) rate was not only raised from 5bp to 25bp but the Fed also removed the cap on the RRP facility (which was at $300bn). It means that program participants such as banks and money market funds can place nearly unlimited amounts of cash with the Fed overnight and earn 25bp. The program size is only limited by the size of the Fed's securities holdings which exceed $4.2 trillion. This sets the overnight riskless rate at 25bp which becomes the floor for the Fed Funds rate. Hi folks, sorry about the extreme ignorance but what security is MM using for the market pricing of rates in those years please? I took the day off yesterday so missed the momentous occasion. They proved they could hike once after 100 cuts, so perhaps there was a lot of high fiving, tickling and a few victory laps after the meeting! Abee: with your query about aud.cad, this may not turn until 1.02 or until the current uptrend line is broken on the downside. I think it is a great long term short from current levels (in the 6-12 month time frame). It is a way of playing aud short without direct dollar exposure. The argument being that cad has had the adjustment based on oil prices vs the AUD which has not adjusted to iron ore prices so much. Aud has bounced recently due to strength in the employment data, which could be decoupling of the Australian economy from resource prices. I think it is more likely just be a tailwind from the property boom there and a lagging effect from the effect of a contribution from net exports to GDP growth in the last quarter (as iron ore prices stayed the same last Q but volumes expanded). I wouldn't expect net exports to be contributing to GDP growth this quarter at all. If one looks at relative pricing based on previous periods, AUD is 0.72, GFC lows were 0.6. CAD has already surpassed GFC lows. AUD.CAD was 0.78 at the GFC lows. I suspect AUD will head towards GFC lows at some stage in the next 18 months and so will AUD.CAD. Australia is currently doing very well and Canada is probably going into a double dip recession. It is certainly possible, but unlikely that Australia will be doing a lot better than it is now and Canada going a lot worse going forward. Given where iron ore, coal, nat gas prices are, aud.usd is getting to be a good value short. Glen Stevens, RBA chap, seemed to indicate to check back in Feb (I.e they are not considering any rate reduction until then) so perhaps people will start looking at shorting AU again in January. The probability of a 1-2 rate reductions in the next 12 months has been scaled back to attractive levels again and there is just the overblown spec short interest to undo, so I am watching that. aud.usd and aud.cad I have high conviction in the short case fundamentally but we just have to wait for the break. usd.cad, I think is starting to get overdone, the technicals are good but the runway is getting less and less. Also Abee, I noticed your question in Michael Pettis's blog, which was a good one and he didn't really address it. What stops the Chinese from applying QE? Their exchange rate, I would guess, but they are slowly letting that slide and decoupling from the USD by stealth (so they think). At some stage the Chinese may well do a QE and Pettis outlines how they could do this and rebalance : by transfers from the government sector to the private sector (government handouts, safety net, privitizations). Chinese or Fed QE would be an incredible signal to go long EM and commodities again. @ Nico G...its not unlimited. Its limited a: by the amount of SOMA securities and B: (more importantly to your point) to 30BB a counterpart. @Booger "What stops the Chinese from applying QE?" The nature of their govt debt market for one - the idea behind govt bond purchases is that the resulting pressure on interest rates and release in lendable reserves then transmits to the economy - in China that mechanism is largely absent in that debt is bank loan dominated, with every provincial govt funded toilet brush factory, steel mill, or coal mine, its own special case, if you will. You are right that there will be some 'stimulus' over there at one point, but it is far more likely to take the form of a PBoC backed facility that repackages the loans to local govts and essentially writes it off. @MM nice summary - I would add this most glaringly obvious question that no one asked - can you point to what data has improved in the last 3 months from the 3 months prior for you to hike now, but not previously? I am wondering if there is still going to be a dollar correction or did we just skip that completely ? I think taking the dollar up into year end is going to be one of those desperate hail mary punts to salvage the annus hornbills for funds. It certainly doesn't hurt that the santa rally would play into that through the usdjpy channel - I am very, very, skeptical that it will work as well as it did last year though - we shall see. Thanks for the comments Booger and MM thanks for clarifying the "lay up " questions given to Yellen, I see what you were saying yesterday now. I heard that some of the journos were blocked from asking the questions they wanted to by management at their respective stations who wanted to ensure that the average joe could understand their questions.....Doesn't excuse some of the trash that did actually get asked though. At the end of the last Fed tightening cycle we were just headed into the GFC. Now they are tightening INTO what looks like a slowdown/recession. Mix in some higher monetary velocity (via 25bp higher Fed target) with no reduction in base money (the banks still need that safety blankie for "stress") and we have a perfect recipe for stagflation. Median CPI is at 2.4% even with commodities having committed seppuku. What happens if commods even half recover? MM - If reminiscing about a rate rise makes you feel old try finding someone who invested or traded through the 70's stagflation. For the anons - sing along to this nice clip. A bad day for Funny Money, Jose Mourinho and the JBTFDers. A good day for boring old fixed income longs and Hammock investors. It's just possible we are entering a period where real economic data and profits might matter for a month or two. Marshall, nothing is less fun or contributes to a higher Misery Index among punters than a good bout of Staggers. I wasn't there in the early 70s, but I gather it was like Chinese water torture for equity traders and fund managers. Nico, bond/FFR market CLEARLY doesn't believe in 4 hikes next year, as explained above by MM. Stock market is a 19 year old coke addict tottering around drunk on six inch heels. I don't know whether she's going to fall but it seems prudent not to get too close to her at the moment. Sticking with my Monday-Tuesday dumpster diving plans for now. Fascinated by the dynamics of Bucky. Reversal of the crowded trade must surely come soon? This month has actually been absolutely splendid so far for me, which can only mean one thing; defensive value is back in business. At least for a while, which is quite amusing of course, and I have little sympathy with the FANGs out there. The whole "path of the Fed" is obviously not set in stone, and I think "data dependency" is the key. I think that punters with a good eye to the economic data will be able to make a fair buck trading front-end futures in the next six months. Nothing is given! I reiterate my view made a while back that the 2s5s bear flattener is the key for me. It is no way close to inversion, but it could get there quickly if a more aggressive path suddenly became the topic du jour. Stay safe, and yes LB ... it has been sobering to watch the implosion of JM this year, sobering indeed! "19 year old coke addict tottering around drunk on six inch heels"
Making sense or not, it kind of feels the Fed is happy now to have restored their "credibility". Yes the guidance seems hawkish despite median plots dropping a notch from the September meeting. Four hikes is the "new normal" with which to start the new year. But at the same time it might be because as such there is more room to maneuver and chip away if need be. Now just easy to pretend everything is developing better, since the first hike is unlikely to have any impact on the real economy anyway, with those mega reserves still slushing around. But look at some preliminary signs - industrial production decreasing, specific citations of weakening global demand for electronics, DJT down 17% for the year, commodities have finally started to catch up on high yield underlying with potential spillover effects still ahead. And what about those sneaky devaluing Chinese which started the whole wobbling process in the first place? Just saying what seems hawkish now, might not seem so hawkish in two to three months if those symptoms start getting any worse. That's why it seems plausible to expect that slowly those expectations start getting nibbled away thus meaning the wave is rapidly passing beneath long USD, short oil, short EM and other inversely correlated trades. Stagflation indeed seems an interesting possibility to take into account. 2016 finally has a chance to become a decent year for value pickers and dumpster divers. Of course, past performance is no guarantee of future results, and two cases do not constitute a statistically significant sample. Just because the dollar weakened twice during the last two periods of Fed tightening does not prove that the same thing will happen again. But it does mean that a rise in the dollar is not automatic or inevitable if the Fed raises interest rates next month. The globally disruptive effects of US monetary tightening – a rapidly rising dollar, capital outflows from emerging markets, financial distress for international dollar borrowers, and chaotic currency devaluations in Asia and Latin America – may loom less large in next year’s economic outlook than in a rear-view glimpse of 2015. "I expect an outperformance of the Australian dollar in the first six months of next year." The Australian dollar looks cheap if you believe China is going to do better than expected, which I do," Mr Jakobsen said. "And it looks cheap if you think the Federal Reserve hike cycle at least initially will lead to a weaker [US] dollar – then the Australian dollar becomes extremely attractive at US70¢. Something changed today. S&P and the yen have been joined at the hip for 2 years. Today they parted company dramatically. More than a coincidence that the fed raised rates for the first time yesterday. I sense a disturbance in the force.